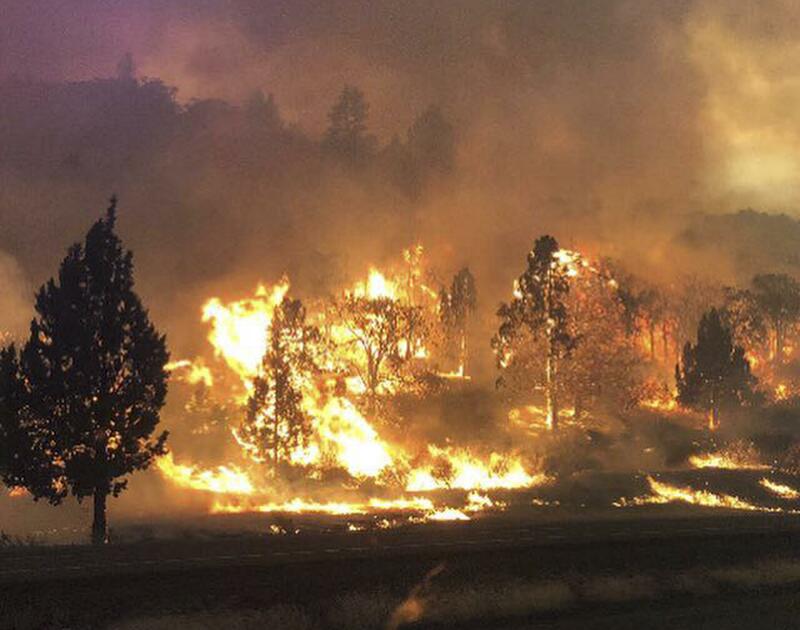 UPDATED: Fri., July 6, 2018, 8:14 p.m.
HORNBROOK, Calif. – A wildfire raging through drought-stricken timber and brush near California’s border with Oregon killed one person and destroyed at least a dozen buildings as it burned largely out of control, authorities said Friday. No other details were released about the death blamed on the fire that threatened 300 homes near Hornbook, a town of 250 people about 14 miles south of the Oregon border. It’s not clear how many of the damaged and destroyed buildings were homes and how many were garages, barns or other outbuildings in the rural area. The so-called Klamathon Fire was one of dozens of blazes across the dry American West, fueled by rising temperatures and gusty winds that were expected to last through the weekend. Heat spreading from Southern California into parts of Arizona, Nevada and Utah threatened to worsen flames that have forced thousands of people to evacuate and destroyed hundreds of homes across the West. California Gov. Jerry Brown declared a state of emergency, citing “extreme peril” to people and property. Farther north in Oregon, authorities urged hikers and other outdoor enthusiasts to avoid forests near the state line. Although the flames have not crossed into Oregon, officials are concerned people in remote areas can’t be reached in case they need to quickly evacuate. The areas of concern include the Pacific Crest Trail, Mount Ashland and the Cascade-Siskiyou National Monument. Fire danger could prohibit rescuers from looking for anyone, the Jackson County Sheriff’s Office said. The fire, spanning 140 square miles , was partially contained, but crews struggled in steep, rugged terrain. With the weather getting hotter and drier, and officials said the fire could grow. About 75 miles east of Los Angeles, a wildfire in the San Bernardino National Forest prompted mandatory evacuations for the entire community of Forest Falls, which has about 700 homes and about 1,000 residents. In San Diego County, a fast-moving wildfire burned at least five homes and as many as a dozen in Alpine, according to journalists at the scene. The governor also declared a state of emergency for the county. The 400-acre fire was only 5 percent contained, but crews had virtually stopped its growth and were focusing on knocking down hotspots that continue to threatened houses and mobile homes, state fire officials said. One firefighter was treated for minor facial burns. In the same county, a fire on the Camp Pendleton Marine base prompted the evacuation of 750 homes. Officials issued a flash flood watch for the 85-square-mile area burned by a fire that started June 1. They say it is just smoldering and rain over the coming days should keep it from spreading. Rain helped a fire in the heart of ski country that has destroyed three houses, including the home of a volunteer firefighter battling the flames near the resort town of Aspen. Gov. John Hickenlooper visited the area Friday. It also offered relief in the southern Colorado mountains where a blaze has destroyed over 130 homes and forced the evacuation of at least 2,000 properties. The Spring Creek Fire became the third-largest in state history at 165 square miles. In a Utah mountain area, a wildfire that destroyed 90 structures and forced more than 1,100 people to flee was growing, but fire officials hoped to gain more control after their work Friday. Many homes and cabins likely burned, while others may be sheds or garages. The fire spans about 75 square miles near a popular fishing reservoir about 80 miles southeast of Salt Lake City, according to the Utah Division Forestry Fire State Lands. It has forced a 35-mile stretch of U.S. Highway 40 to close since Wednesday, said Sonya Capek, a fire spokeswoman. Officials believe human activity sparked the blaze, but an exact cause hasn’t been determined. Published: July 6, 2018, 2:11 p.m. Updated: July 6, 2018, 8:14 p.m.